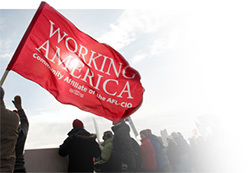 Working America is the community affiliate of the AFL-CIO, and is the fastest growing organization for working people in the country. At 3 million strong and growing, Working America uses their strength in numbers to educate each other, mobilize, and win real victories to improve working people’s lives. Click here to visit the Working America web site, for more information or to join the organization! Together, and in solidarity with working people across the country, we fight for our common interests—good jobs, affordable health care, education, retirement security, corporate accountability and real democracy. We want to ensure our kids have a quality education, our grandparents don’t have to decide between paying for their monthly medication or paying for food and that we will have a secure retirement when our working days have ended. Since 2003, we’ve been organizing in neighborhoods across the country. We talk with our friends and neighbors to learn their needs and priorities and get them engaged on the issues that matter most. And we provide tools, research, information and assistance that can help make working people’s lives better. As part of Working America, working people get a chance to be heard in the political debate and make positive changes in their communities. We’ve helped increase the minimum wage in Ohio, save thousands of jobs in Pennsylvania and Colorado, protect workers’ rights in Minnesota and get more health insurance coverage for kids in Oregon. Across the country, we take the lead on the issues that matter to the 99%. We unite working people on commonsense issues of economic justice—and we win. We are Americans who care that everyone has a voice, and we know that, united, our voice is 3 million times stronger than standing alone. Together, we can challenge the corporate agenda across the nation and make things better.